Wellesley’s Abby Comella (right) is on her way to winning a 100-meter heat against Framingham on Wednesday. 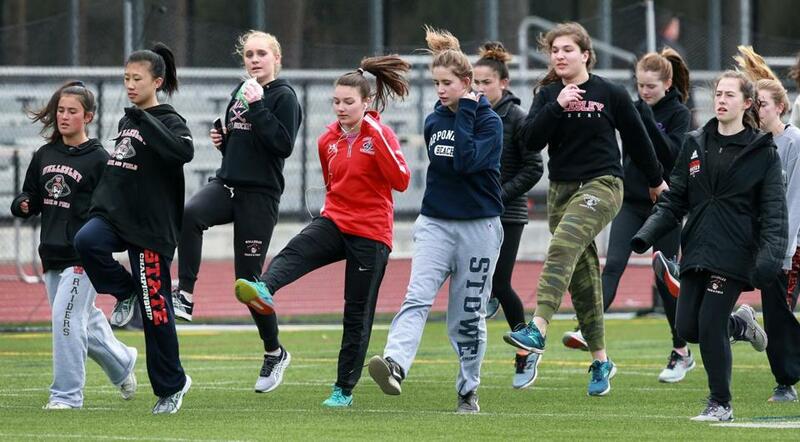 The Wellesley girls’ track and field team won the All-State title last winter — and last spring. In February, paced by the Globe All-Scholastic 4x400 relay team that set a meet record (4:00.16), the Raiders did it again. And after opening their 2019 outdoor season with a 119-16 win over Framingham Wednesday, the Raiders appear poised and ready to defend their success in their quest for their fourth-straight state title. 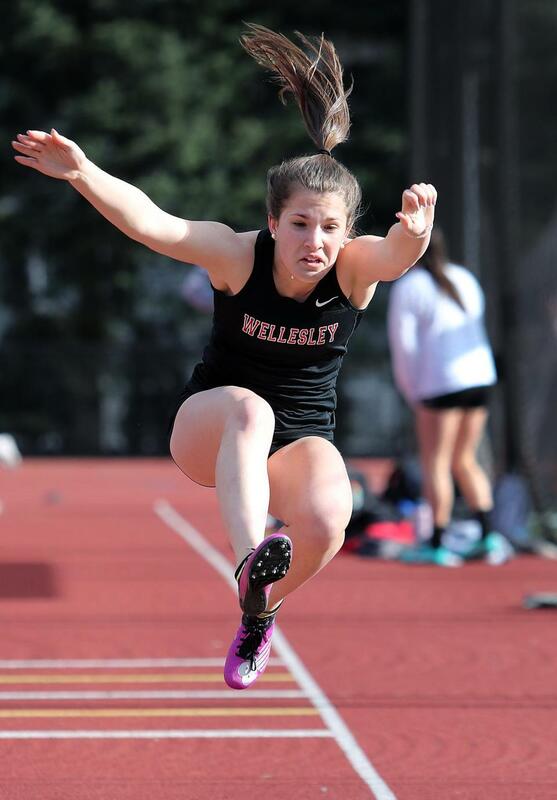 Wellesley’s Charlotte Freniere competing in the long jump. Abby Comella, Charlotte Freniere, Zoe Geiger, and Anna Jordahl-Henry, who made up the 4x400 relay during the indoor season, and senior captain Maggie Donahue, an individual All-Scholastic, return to boost the Raiders’ case this spring. Seniors Caroline Rogers and Annie Ward join Donahue and six other upperclassmen to captain the Raiders, who are once again under the command of 12-year coach and 2019 D2 indoor Coach of the Year John Griffith. 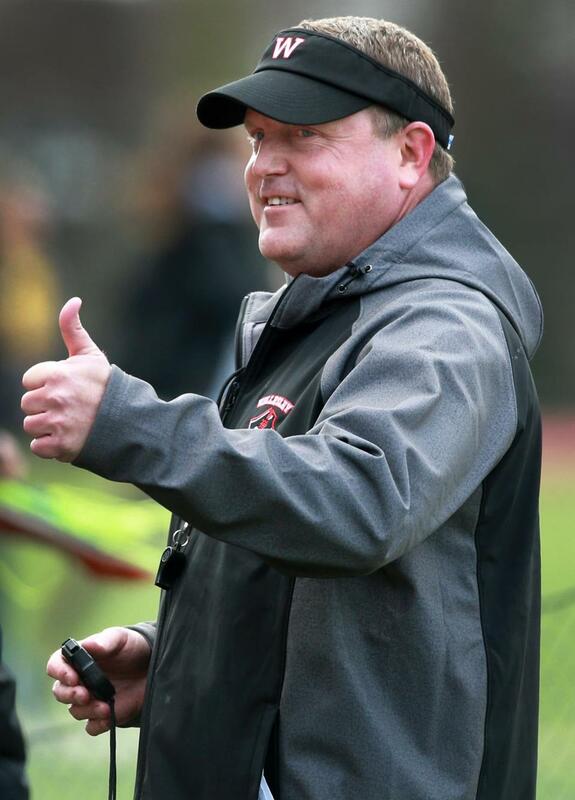 Coach John Griffith likes what he sees during Wellesley’s meet against Framingham. Donahue remembers winning the divisional meet during her freshman year, citing the strong performances of Ally Isley, a junior now on the Williams College track team. It’s difficult for the Georgetown-bound Donahue to consider herself as the 2019 team’s Isley — the face of a new era and a new expectation for Wellesley track. But Griffith knows his senior class has undoubtly left its mark on the team. There’s talent throughout the Wellesley athletic department — the girls’ hockey team won the D2 state title this season, and the girls’ lacrosse team was crowned the 2018 D1 champion. But after winning their first-ever All-State title in the winter of 2018, then going on to win two more, the Raiders believe there’s more to be said about the girls’ track team. The Wellesley girls warm up for their meet against Framingham. Ward, a throwing captain, is only in her second season on the squad. She played lacrosse before swapping to track and field as a junior. The 5-foot-10-inch senior, who was also a forward on the basketball team, felt right at home. And it shows in her results — Ward won the discus (75 feet 11 inches) and javelin (74’ 5”) in last week’s opening meet. At practices, the boys’ and girls’ teams often practice together. Donahue said the joint sessions offer a new perspective for the girls and give them the opportunity to develop their skills. Ward offers a unique perspective, since the Wellesley girls’ and boys’ throwers practice together every day. She, too, sees the benefits of double-duty workouts. According to Griffith, there are more than 100 girls on the Wellesley track team. Strength in numbers rings true for the Raiders, and the captains attribute the squad’s success to the constant encouragement everyone receives from those around them. The distance runners adopted “secret Raiders” and anonymously gifted candy to their teammates. Pasta dinners and post-practice breakfasts are staples of the Wellesley girls’ program. The relationships are evident on the track, too. During their season-opening meet, the Raiders lined the infield, following their teammates along the track and shouting their names as they competed. The Raiders follow the acronym T.E.A.M. — together, everyone achieves more. Jenna Ciccotelli can be reached at jenna.ciccotelli@globe.com.